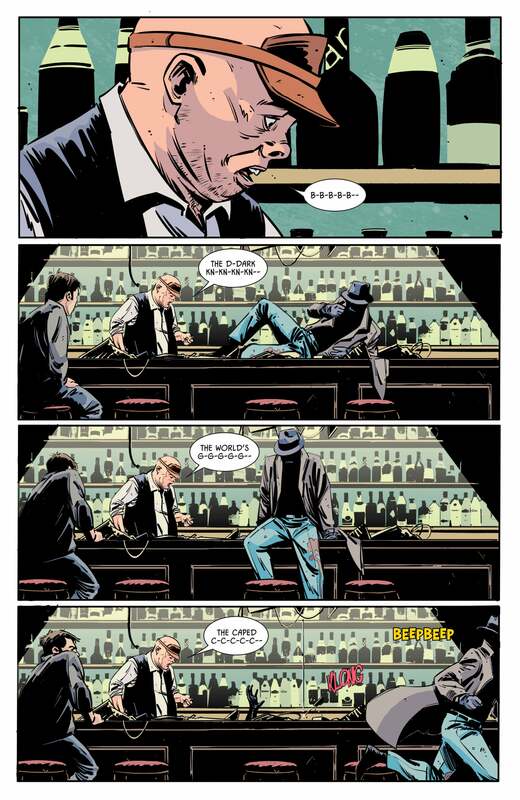 There are times when it can be difficult to suss out how much of the characters in comics, such as Batman written by Tom King, are reflections of the author and his collaborators, and how much are them channelling who the characters are, and letting them speak through the panels. 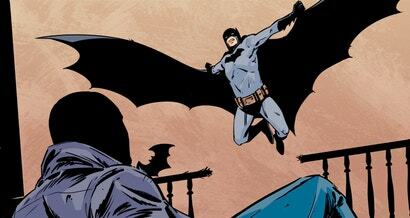 This week’s Batman #67 is an excellent exercise in the latter. Over the last five Batman issues, Bruce Wayne’s come face to face with a number of past demons in a variety of strange circumstances that have him all but certain he’s trapped within some sort of illusion designed to drive him mad. Being confronted by his tumultuous relationship with Catwoman and the return of Gotham Girl have pushed Bruce to his psychological limits, and the lines between delusion and reality have become difficult to see clearly. Batman #67 — written by King, with art by Lee Weeks and Jorge Fornes, and colours by Lovern Kindzierski — is still every bit as heady as the issues building up to it, but rather than relying heavily on dialogue to convey what everyone’s feeling, the comic instead tells a story almost entirely through visuals that illustrate everything you need to know in order to understand where Bruce is, mentally. Somewhere in Gotham, Batman’s on foot and in hot pursuit of a criminal, and as the two costumed heroes crash their way through the city, it slowly becomes clear that what you’re looking at is the very essence of the Dark Knight’s never-ending crusade to protect his city. 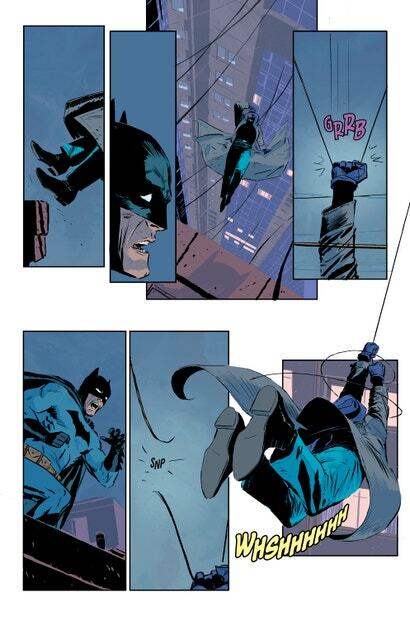 What begins as a simple rooftop chase turns into a bombastic pursuit complete with broken windows, expertly-flung Batarangs and perilous jumps that could easily lead to Batman or the criminal’s deaths. But no matter how dangerous things become, neither is willing to call it quits. When you first look at them, the kinetic illustrations look like the kinds of scenes you’d expect to find in any chase-heavy Batman book, but when you pay closer attention to Bruce’s expressions throughout the issue, you can see that he’s unsure of himself and the nature of this reality. The Batman side of Bruce’s identity is present and carrying him through the motions of every leap, punch and cape flourish, but the part of him that’s just Bruce — the purely human part — hesitates and very noticeably telegraphs the fear and doubts running through his mind. Nothing about this chase is normal, and yet everything about this chase is normal — normal in the sense that it’s a very Batman™ slice of life story about two costumed folks running around a megacity and bothering regular people with their shenanigans. Bruce clearly has a singular target in this instance, but in his desperate, seemingly endless pursuit of them, Batman #67 is effectively describing the whole of Batman’s vigilante career in as succinct a way as possible. No matter how long or far Batman has to chase villains, he’ll never stop — no matter the harm done to him or, in some cases, the damage done to the place he’s meant to be keeping safe. It’s easy to see the admirable honour there is to Batman’s convictions, but the issue also highlights how maddening being so committed to an endless cycle such as this is, with a clever throwback to the time the Dark Knight crossed paths with Elmer Fudd. This isn’t just one chase of Batman’s life, it’s every chase — strip away the superpowered friends, and larger-than-life situations, and this is who Batman is. Batman #67 ends with a twist signalling that the comic’s larger arc is about to come back into focus in the next issue, but it’s an excellent break in plot that gives you a heartbreaking appreciation for just what Bruce Wayne’s out here doing night after night.